Falls Is The Best Time To Plant Trees – Ekana Nursery & Landscaping, Inc. When spring hits, nurseries have a large selection of trees and flowers. It’s natural to think that this is the perfect time to plant trees, but actual conditions are better in fall. It may seem counterintuitive since the sun is shining, the leaves are green and growth is everywhere, but you might want to wait. Fall may lack the green and growth of spring, but when it comes to planting trees, you’re giving its best chance at life. 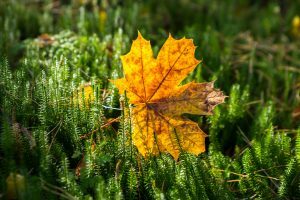 Fall is a natural time for plants to head back to basics. They’re preparing for winter, so they shed leaves and focus on keeping their roots strong. When winter hits, the roots are more important than the surface. Planting a tree in fall helps it create strong roots because it’s not focused on growing the tree and leaves. It develops deep roots, survives the winter and is ready to continue growing the roots and new leaves come spring. Spring is the opposite. There’s more time to prepare for the winter, but new trees don’t have the resources to grow deep roots and new leaves. In fact, many times newly planted trees grow new leaves and lose them early because the plant doesn’t have enough resources. While fall planting is generally preferred, the state of the tree prior to planting is a concern. Nurseries often have their biggest supply of plants in the spring, so pickings can be slim come fall or the trees may not be in the best shape. Large nurseries and big box stores have a problem with tree care before purchase. If you buy a tree on sale at one of these places, it’s likely been sitting for months. The summer heat can be difficult for new trees to handle, so make sure the plant is in good shape before you buy it. Small nurseries tend to receive new trees throughout the growing seasons. Trees that lose their leaves in fall need only a small amount of water to grow roots, but this isn’t the case with evergreens. Evergreens keep their leaves and needles all year round. While their water needs are less during winter, it can still lead to brown and dead needles in the spring. It’s a good idea to wait and plant evergreens in the spring. They end up healthier and when spring comes have green needles and leaves. While the water needs of a fall plant aren’t as robust as a spring planted tree, they still need regular watering. Spring has more rain, so they may not need watering or not need it as often. Fall plantings need water. If you don’t water them, then they can’t develop the root structure to survive winter. Ekana Nursery and Landscaping has a wide selection of trees during both the fall and winter. We take pride in maintaining them throughout the year, so you never have to worry about their condition. If you want to learn more about tree planting, then explore the rest of our website.